Hussaina Abdullahi, 19, arrived in Korea two years ago from Nigeria after being introduced to the culture through the Korean Culture Center while she was in school. The information she received there coupled with an interest in K-dramas was enough to make her decide to come to Korea for university. “It still doesn’t feel real,” she said. “Coming here was crazy, one of the biggest things I wished for actually happened.” After completing a yearlong language course and now almost halfway through her first year of economics at Sungkyunkwan University, she is settled into Korea and happy here. However, the adjustment period came with some disappointments. Being Muslim, she was “heartbroken” when she realized how many local dishes contained pork and was initially shocked by the amount of people smoking and how short skirts could be. Also, living in a new culture was hard at first. “When I first came here, that was the first time I left my country and I was just 17, so with people staring at me it was hard. I felt like everyone was looking at me and I walked with my head down and I wouldn’t ride the subway alone because I was uncomfortable,” she said. However, she soon found her “first family in Korea” in Salam Nuri, a local Muslim group. The group was formed by a community of Muslims -- from Korea and around the world -- who aim share the culture and traditions of Islam with those who are interested. The group was formed in 2012 to reach out to the growing Muslim community here, which now stands at an estimated 140,000. The organization holds fundraising events as well as seminars, workshops and Arabic classes that are all open to the public. On top of university and a part-time job, Hussaina volunteers as a media manager with the group. She was introduced to the organization by Safa Lamia Ahmed, a physics students at Ewha Womans University from Bangladesh. For Safa, the organization serves as a home away from home. “Outside of school I wouldn’t really say I have really close friends at university. My closest friends in Korea are from Salam Nuri or from my first year (here) during the language classes,” she said. Safa’s life in Seoul is a far cry from her time in Asan, where she studied Korean after she arrived in 2013. In an area that doesn’t have a big foreign population, her appearance was often met with shock. With daily stares and questions about her hijab, she replied with a smile and used the opportunity to practice her language skills and soon found that the local community warmed to her. “I think Korean people don’t have much knowledge about Muslims. The thing you don’t have knowledge about, you’re scared of, right?” she said. The 24-year-old, who is also a volunteer with the organization, sees her role in the group as an opportunity to wipe out the prejudice Muslims in Korea face, which she says usually focuses on terrorism -- an association that has cost her jobs. When she declined, she was told not to come to the interview. The recruiter apologized, saying that “people would be scared,” although she is not sure if the issues was with the recruiter or the client. “I wasn’t really surprised but it felt bad that it wasn’t because I didn’t have the ability to teach, it was because of my hijab,” she said. After this incident Safa stopped applying for jobs. She currently works at a Korean Halal restaurant owned by one of the leaders of Salam Nuri near the mosque in Itaewon. Hussaina, who works at the same restaurant, said she didn’t apply for any jobs because it’s harder to get work outside the university if you wear a hijab. While a university might be more diverse in its hiring practices, having a convenient place to pray on campus can be a struggle for some. After clearing it with a professor overseeing international students at her university, Safa said she was given the green light to use the chapel and an adjacent multipurpose room located in a science building -- where she spends most of her day -- to pray. However, she said she arrived one day to find “Muslims no trespassing” written on the whiteboard. While the sign was later erased, she said she feels unwelcome and usually uses what empty space she can find instead. Ewha Womans University pointed out that, although it is a Christian school and a lot of the prayer rooms are for Christians, it does provide Multicultural Meditation Rooms in two student dormitories -- on opposite sides of the campus -- which Muslims are welcome to use for prayer. The university also stated they have not received any complaints or any expressions of discontent from Muslims at Ewha or from any other religious or nonreligious groups regarding prayer rooms or lack thereof. While Safa says any bad experiences she has had here are exceptions rather than the rule, she hopes Koreans will become more open to learning about her religion beyond what is shown in the media. With the government announced earlier this year plans to expand the number of Muslim-friendly restaurants and Lotte has opened a designated prayer room for Muslims in its Jamsil store, one could conclude that Korea is showing strides towards change -- even if it is for tourism purposes. 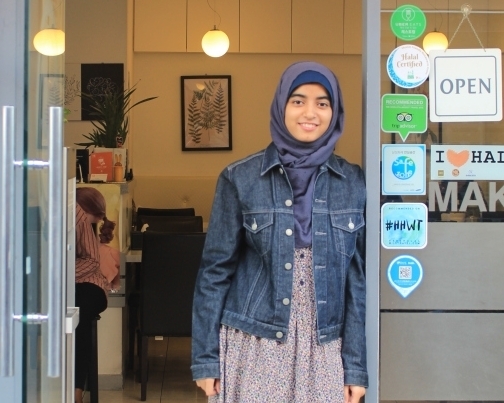 Hussaina hopes that as Korea becomes more globalized, it also opens its doors more to Muslim society -- if anything, to better the lives of the Korean Muslims here. “This is their society, we can always go back to our country but they only have Korea. For them to live, eat and work here is more challenging because the moment they put on the hijab they also find it difficult to (find) work and they also receive discrimination from fellow Koreans,” she said.